The U.N. refugee agency reports thousands of Venezuelans are risking their lives by fleeing to neighboring countries via irregular dangerous pathways since official crossing points are no longer available to them. Venezuela officially closed its land borders with neighboring Colombia and Brazil nearly six weeks ago. 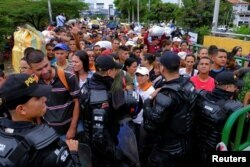 The move, however, has not deterred thousands of Venezuelans who leave their country every day. FILE - Venezuelans carry their belongings along a pathway after illegally entering Colombia through the Tachira river close to the Simon Bolivar International bridge in Villa del Rosario, Colombia, Aug. 25, 2018. UNHCR spokesman Andrej Mahecic said the journey has become more perilous. He said many people are wading across swollen rivers or risk being exploited and abused by armed groups controlling treacherous irregular paths. "On Tuesday, security forces on both sides of the border struggled to control the situation as some 46,000 desperate people forced their way across the Simon Bolivar International Bridge between the Venezuelan town of San Antonio de Tachira and the Colombian city of Cucuta," he said. "… With heavy rain having swollen the river and flooded many of the footpaths, the only viable option for most Venezuelans was the bridge." Colombian riot police block the way to the Colombian side in the Colombian-Venezuelan border on the Simon Bolivar International Bridge in Cucuta, Colombia, April 2, 2019. Mahecic said people are moving in both directions; and not everyone who crosses the bridge remains in Colombia. Many Venezuelans cross into Cucuta every day just to pick up items they cannot find at home, he told VOA. "It may have been buying some food or maybe purchasing medicines — things that they cannot find in Venezuela right now," he said. "And then they head back. Not necessarily everybody will continue to Colombia or other countries beyond Colombia. So, this has been the situation for a very, very long time." 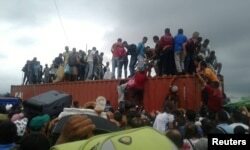 People climb atop a container used as a barricade at the Simon Bolivar international border bridge in San Antonio Del Tachira, Venezuela, April 2, 2019 in this picture obtained from social media. Mahecic said the pileup of people on the Simon Bolivar International Bridge created a very scary situation, with many people panicking, fearing they might be crushed. Fortunately, he said no one was hurt, but the risk is always there. He said the situation is an example of the dangers of irregular cross-border movements. 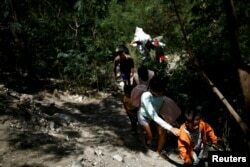 FILE - Migrants walk along a pathway after crossing illegally into Colombia across the Tachira river in Villa del Rosario, Colombia, Aug. 24, 2018. He also said it shows the extent to which people are willing to risk their lives in hopes of finding a better alternative to their situation. Embattled Venezuelan President Nicolas Maduro contends his government has been victimized by an "economic war" led by political opponents. He blames past U.S. financial and oil sanctions for the country's economic crisis.